Let’s talk about the art of subtle sales aggression. We’ve all had that icky pushy sales experience, and nearly all of the pushback I get from store owners or managers about sales has to do with that experience. “I don’t want to be pushy” or “I struggle with overcoming objectives because I don’t want to pressure them” to which I say GREAT ! Because being pushy isn’t required! In fact it’s the absolute last thing you should do. BUT you have to do and say SOMETHING! The alternative is NOT sitting back and letting the customer walk all over you OR doing so little that you barely interact with them at all. There are actually quite a few ways you can still sell aggressively with incredible focus and intention without being pushy and I want to talk about what they are and how exactly you can use them to improve your sales results! First- we have to talk about silent sellers. Silent sellers are things like visual merchandising, product displays, ads, social media posts, loyalty programs, and signage. Basically anything that helps grab your customers attention and sells your products without you having to interact with them. 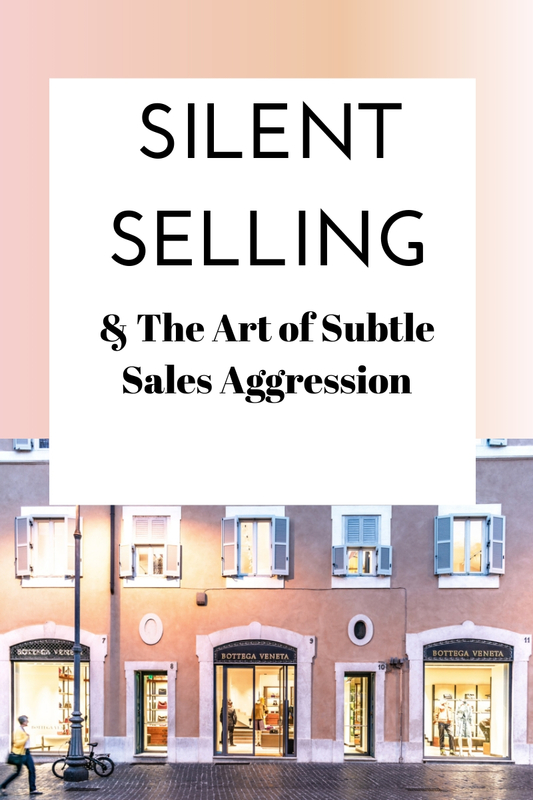 Your silent sellers have to be ON POINT and consistently thoughtful (helpful even) because the less intentional your silent sellers are, the harder you have to work to verbally and physically sell each piece of merchandise. This means you have to be vigilant about available opportunities to silently sell and opportunities for keeping those silent sellers fresh and updated. So, look around your store. Look for BIG opportunity to fill and sell your merchandise! Literally! Where is there empty space that could be filled with more product? What are your highest traffic most visible areas of your store and are you selling product there with displays and signage? Where is there opportunity to relocate merchandise to better areas in the store, to unclutter and pull in more focused attention to specific pieces? Where is there opportunity to pair and style complimentary items together so you can sell more than one product at a time? Where is signage missing? Is your signage consistently spaced, placed and made with quality paper and holders? Or is it cheap and devaluing your store experience? Silently selling is simply taking advantage of every space you have to show off your merchandise and the endless options they offer to your customers. It’s a chance to organize your product in a way that makes it super easy for them to shop. So, when you look at your sales floor, the displays, and the windows, you want to ask: is this inviting, or overwhelming? And don’t over think this either. You don’t need to plaster signage everywhere and completely take away from your store’s atmosphere. The atmosphere in itself is a silent seller. Everything from the color of your store front, the awnings, the style of your decor, the cleanliness, and the design should be helping you sell! Over complicating the shopping experience with inconsistent silent selling standards is one of the many things things that makes your job harder. You have to step in and answer questions, and fill the customer in with information that wasn’t provided on a sign, in an ad, on a coupon, on a price tag, in a social media caption. Etc. So where does the aggressive part of these sales tactics come in? Well, you have to be aggressively dedicated to filling holes, being proactive, maintaining store standards. That means checking window mannequins daily to make sure every display is properly layered and accessorized, that stacks and racks of product are promptly replenished, not too full or too empty and if they aren’t to the store standard - you’re holding your team accountable! Having standards at all is a good place to start. What are your store standards for displays?! How many inches of negative space on a wall is ok? How much space do you allow between jet rails and shelving? How many pieces of clothing do you want on each mannequin? How many items are you trying to sell to each customer? What’s your policy on clean windows, and updating table signage? What kind of process do you have in place for surveying your sales floor, and checking for these standards and making adjustments when they aren’t met? See what I mean about aggressive? It takes dedication, but these silent sellers are the things that make your job on the sales floor sooo much easier! Store standards, no matter how trivial, save you time and maintain a level of consistent quality. You don’t have to be pushy with the customer, because you’ve already pushed yourself to maximize and optimize the space in your store to sell the best it possibly can without having to say a word. You can now step in as a gentle and friendly service provider, there to answer questions when the customer has them! You can then use your silent sellers as a resource that allows you to talk about your product easily with a great visual aid! You can use your displays to help you point out product or grab extra things to add on at the fitting room easily. It’s completely subtle and genuinely helpful to the customer and that makes all the difference in easy selling! Now, the last part is customer service. It’s the part that requires you to enthusiastically interact with your customers every day! It’s not about prepared speeches and slimy tactics. It’s about asking the right questions and then listening. It’s about using the store displays, and signage that help you sell easier. It’s about committing to a standard of service that is observant, valuable and helpful. Selling is only ever as difficult as you believe it is. Quit psyching yourself out, believing that each customer is difficult to sell to. Not to mention, being prepared and informed about your product, pricing, and having an optimized store with brilliant silent sellers drastically reduces customer objections, and drastically increases your sales confidence! I know that’s a lot to digest in one sitting, and you’re probably wondering where do I even begin? This is an art, and it takes time, discipline and learning from your experiences to really nail it down consistently, so I made something for you! Brick + Mortar Mentorship, my 6 week retail education program kicks off April 22nd, and I would love to see you there! Come learn how to implement store standards, processes, sales strategies and systems, so you can grow your business and make selling easier on you and your team! The Ultimate Guide to Cash Counter Efficiency COLAB with Jenna of Workspacery!